Kohana 3.3 has a file named “composer.json” in the root of the project, however it is not configured for Kohana and Composer is not installed. This example is tested on a Mac. Windows users will need to install Composer from the instructions on the Composer project site, at http://getcomposer.org/doc/00-intro.md. First, modify composer.json to tell composer where to install libraries. Open a terminal and navigate to the root of your Kohana project. Add this to bootstrap. Right above the router configuration is a good spot. You can either edit composer.json with your required library (and then re-run the install command above), or use the composer require verb from the command line to add the library, which also modifies composer.json. php composer.phar require "monolog/monolog" "1.6.0"
The monolog package page is https://packagist.org/packages/monolog/monolog. Note that you need the package name for the first parameter and the version for the second parameter. IMPORTANT! First back up your database! This procedure will allow you to drop many tables at once where each table name to be dropped starts with the same string. This creates a MySQL statement file that will drop all tables that begin with a specified string. Examine drop_commands.sql to make sure it is doing what you want. Run the drop_commands.sql text file through the mysql interpreter to drop all the selected tables. IMPORTANT: This is a dangerous command. Back up the database first! Drop all tables in a database, without dropping the database itself. This creates a MySQL statement file that will drop all tables that begin with a certain string. If possible, don’t use SSH when upgrading a server. On Linode, you can use their Lish terminal, available from the virtual server’s console page. This was tested while upgrading a 10.04 LTS Ubuntu Server to 12.04 LTS. The test server was a production web server with a large number of packages installed and configuration changes. If your virtual hosting provider offers image backups, this is a good option. The important thing is knowing for certain that you can restore/recreate the server in case the upgraded server is not left in a bootable, usable condition. Run this command to check whether “/etc/update-manager/release-upgrades” has the line “Prompt=lts”. When prompted for a new MySQL root password (sever times during the upgrade) Enter was pressed without entering a new password. The existing MySQL password was retained by the server with no issues. When the upgrade manager encountered a configuration file with custom changes, the existing, modified configuration file was retained (not replaced with the distribution default configuration file). This worked well. The only change needed after upgrading was adding a new line to phpMyAdmin’s configuration file that was needed for the new phpMyAdmin version. Using your web browser, navigate to https://developers.google.com/speed/pagespeed/module/download. Look on the right side of the page, under Latest Stable Version and right-click on either the 32-bit or 64-bit .deb package (based on whether you are running 32-bit or 64-bit Ubuntu Server. Select Copy Link Address to get the download link in your clipboard. In your server’s terminal use wget to download the module. Have you taken on the admin role for an Ubuntu Server? You do need to configure it as a web server with one or more websites? I use separate, very long, randomly generated passwords for everything. This short script does the job. echo "usage: genpasswd [number of characters]"
If you have a script to automatically back up to Amazon S3 from your server, it is good to limit the age of stored backups. This bash script allows you to use s3cmd to do just that. You specify the bucket to process and the age os files to retain. Important: You must first install and configure s3cmd. echo Usage: s3-del-old "bucketname" "time"
echo Example: s3-del-old \"mybucket\" \"30 days\"
echo "Do not include a leading slash in bucketname." echo "ERROR: Do not start bucketname with a slash." echo "ERROR: Do not start bucketname with \"s3:\""
Do you have a server that you can access with OpenSSH? Do you want to be able to browse the web, even non-SSL, unencrypted pages, without others on the network being able to see what you’re looking at or even hijacking your sessions? Given the existence of Firesheep, it is really easy for even unsophisticated users to hijack a web browsing session. The method I’m presenting is easy and effective. OpenSSH makes this a snap. Your web browsing packets will be routed via an encrypted connection to your server. First, in a terminal, open a SOCKS connection to your server with OpenSSH. Just add “-D 9999″ to your normal SSH command. 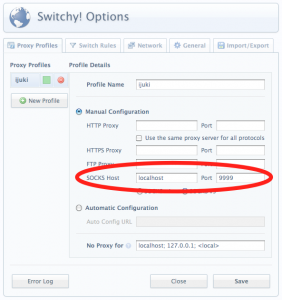 This will create a SOCKS proxy on localhost at port 9999. You now have a proxy on your local computer using SOCKS on port 9999. Now we just need to use it. This can be easily found in the Chrome Web Store. Open the Switchy! Options dialog. Type the a name for this proxy in Profile Name. On the SOCKS Host line, enter “localhost” in the first blank and “9999” for the Port. Click the Save button. You are using a SOCKS proxy running on your localhost. Then, select the proxy by clicking the Switchy! icon in Chrome and selecting the proxy name you just entered. You are now using a secure connection to browse the web. Note that someone on the network where your server is hosted can still snoop your traffic, but not in the Starbucks where your are sitting. When you need to give users access to files that are not in the public directory, where you cannot simply use an anchor tag with an “href”, you need to do a bit of work. For example, if you’ve created an authentication system where only authenticated users can download or view a file, this can be necessary. There you have it. Your user can click the link for the file, which then runs this code. In my case, this is in a Kohana controller. The files are not stored in a public directory, so unauthenticated users cannot access them. If a file is created on the fly, like a PDF of an invoice, this will also work.